So often, the Northern Life Yoga team focuses on highlighting our class offerings and special events. So I want to highlight the Northern Life Yoga instructors themselves - beyond what you read in their biographies. While they are all unique in their styles of instruction, they share a passion for yoga and one other common denominator - they all have heart. When I reflect upon all the ways our instructors share their hearts, it is truly remarkable. Nancy - From gentle yoga to chair yoga, Nancy’s calming instruction is truly a gift to our yoga community. She continually invests in ongoing yoga training, including restorative yoga and also yoga for recovery. In addition to her three classes weekly at the studio, Nancy works with the Bay Mills community to introduce yoga for patients at Bay Mills Health Center. Now retired from Sault Schools, Nancy continues to devote time working with students at St. Mary’s School. Jennifer - A true nature lover, Jennifer spends time exploring local trails and takes time to share the extraordinary elements she uncovers in her hikes through uplifting Facebook posts as a way to add positivity to our news feeds. Her day job as a home care nurse is book-ended by fitness and adventure on Sugar Island. Jennifer’s instruction comes from a very grounded foundation and continues to evolve in beautiful ways, just like nature. Lola - A true performer, you'll often find Lola singing, dancing or acting on stage at Soo Theatre and beyond. A gifted and skilled belly dance instructor, yet what makes Lola so lovable is her down-to-earth approach to making people feel completely comfortable, even when they are outside their comfort zone. Lola has been teaching belly dancing for several years - and she enhanced her talents through the yoga teacher training program. Her sparkling personality shines through in her upbeat yet very grounding yoga classes. A trained Reiki Master, Lola also offers her healing energy in private sessions and through our monthly Yin & Reiki workshops. Kristi - Life has come full circle with Kristi teaching Pilates at Northern Life Studio! It was Kristi who gave Northern Life Yoga the opportunity to launch. When I returned to SSM in March 2010, I rented space from Kristi’s Hip Hop Studio to teach yoga classes and develop a yoga community. One year later, our timing coincided well to move on to new endeavors - Kristi wanted to focus on her other business (Curves) and I was ready to develop my own studio space. We continued to collaborate on community events together, including United Way fundraisers and Girls on the Run. I am so thrilled that Kristi is teaching her very popular and power-packed Pilates classes as an expansion of our class offerings. What a delight to have our paths come together once again! Barb - A true pioneer with introducing yoga into schools locally, Barb teaches after-school yoga at JKL Bahweting School. She has even created her own home yoga studio that serves as a source of creativity for her to practice and play the singing bowls with her sweet daughter, Ali. Although Barb decided to discontinue teaching a regular weekly class at our studio, she continues to offer kids yoga workshops and most recently trained in Shake Your Soul for an adult dance/fitness offering. She’s also a very popular sub for our flow classes! Last, but certainly not least, Maxx has offered enduring support to Northern Life Yoga for years. Maxx may be most well known in our community for selling real estate...but she's a dynamo when it comes to motivating others. Whether it's leading our local Women in Business group, leading Maxx PR or creating fun and entertaining fitness videos with her son, Chad - Maxx's motivation is always present in person and online. Her weekly core strength class combines her 30+ years of fitness with her passion for yoga. Since she's the mother of two grown gentleman (and former pro football players), Maxx is always willing to fill in to teach when many of us have family commitments. She also offers festive pop-up classes, such as Yoga Glow. So very thankful to have Maxx's ongoing support! My own heart is beyond grateful to have Nancy, Barb, Jennifer, Lola, Kristi and Maxx as part of Northern Life Yoga. Hope you will experience the many ways our instructors share their hearts both on and off the mat. If you've ever wondered what goes into planning a yoga class, it will vary greatly by the instructor and style of practice. Based on hundreds of yoga poses and variations and breath work, the class design possibilities are infinite. In a Kripalu yoga class, there's a specific structure that includes centering, warm ups, asana sequences, meditation and relaxation. Designed to awaken a non-judgmental self-awareness, the Kripalu approach offers a safe, disciplined practice that combines Western science with Eastern philosophy to promote vitality. Overall, Kripalu yoga is known to be very gentle, so when Master Teacher Coby Kozlowski designed a Kripalu vinyasa structure, it needed to honor the integrity of the Kripalu philosophy, yet provide greater challenge for those who desire an active practice. Kripalu Vinyasa was born out of a skillful approach that offers a meditation in motion through an evolving sequence that grows deeper within a selected theme. Think slow burn. Despite the slow flow, a Kripalu vinyasa class will certainly feel like a workout. The word vinyasa is Sanskrit for "to place in a special way." Traditional vinyasa style classes often move so quickly that the placement of body parts on the mat - whether hands, feet, seat - can distract from the experience of connecting mind and body. Faster movement increases chance of injury...but we all want our cardio, right? Let's face it - we all want to check "workout" off our daily task list...and perhaps practice meditation for enhanced self-care. Kripalu vinyasa provides a generous detox through a good sweat and plenty of cardio challenge - and yet, it becomes a "work-in" through a melody of movements that evoke a feeling of turning inward. A Kripalu vinyasa class actually allows you to check two tasks off your to do list: workout and self care. Beyond the Kripalu structure, the specific anatomy of a Kripalu Vinyasa includes practices from the four paths of yoga: jnana - the path of wisdom and knowledge; hatha - path of physical connection; bhakti - path of love and devotion; and karma - the path of self-full service. While these practices may be subconscious to most practitioners, what you will feel is the full body stretch from exercising multiple fascial lines through side bends, forward folds, backbends and twists in every class. As with all yoga, the combination of breath with movement leads to self-transformation and self-discovery...empowering you to realize your full potential. Kripalu Center for Yoga & Health offers trainings, programs and R&R activities for 60,000 visitors a year. This summer, I completed two 75 hour training modules working toward a 500 hour yoga teacher training certification. In the most recent vinyasa module, Coby surveyed the 30 yoga teachers in the room on injuries - and nearly everyone had sustained an injury at one time. In fact, I had been nursing my own shoulder strain likely from too many chatarunga push-ups. As my personal practice and training progressed this summer, my shoulder healed - and I am convinced of the safety of the Kripalu Vinyasa practice. Instead of whipping through chatarungas to break a sweat, I am embracing the infinite possibilities to enjoy meditation in motion through creative sequencing without including the typical plank/chatarunga/up dog/down dog. As both a practitioner and instructor, I will always continue to explore the many styles of yoga...but my focus is sharing this unique class offering with the Northern Life Yoga community. Planning a Kripalu vinyasa class exercises both my left and right sides of the brain with both structure and creativity - but most importantly, what I love is the way a Kripalu vinyasa class feels. I invite you to experience the true meaning of vinyasa - to place in a special way - and then observe the effects on both your body and mind as you explore self-transformation and self-discovery. When I was in my 20's and 30's, I welcomed business travel as a way to explore various restaurants along with occasional sightseeing as time allowed outside of meetings. In fact, I would often plan my meals based on the Zagat's guide for each city, balanced by workouts in the hotel gym or pool. Now I search for the nearest yoga studios and carefully plan my free time based on class offerings. In fact, I happily give up dining out in favor of taking a yoga class and grabbing healthy take-out afterwards. No matter where I travel, the familiarity of the practice is always grounding. In urban areas, I particularly enjoy how complete strangers can fill a room and immediately become connected through the practice of yoga...we share the same breath and guided instruction along with an appreciation for the practice. On my last trip, the nearest yoga studio also had a juice and smoothie bar - bonus! Not only did I sample several yoga classes, but I managed to work my way through a very unique and cleansing raw food bar menu. Apparently my interest in menu sampling has not faded after all. Every year, a group of travel writers visits the Eastern Upper Peninsula to experience what we have to offer from sites to recreation. This year, their schedule included kayaking with Bird's Eye Adventures and a Sunset SUP yoga class with me. Since their itinerary was planned in advance and full of activity each day, there was very little room for a Plan B should the weather or wind not cooperate. So when the travel writers arrived at Sherman Park at 6PM on a Friday and the forecast was calling for a 90% chance of precipitation (and 9MPH SE wind!) in our remaining hour of daylight, what else was there to do? After assessing their experience with yoga and paddle boarding, we decided on an abbreviated session. 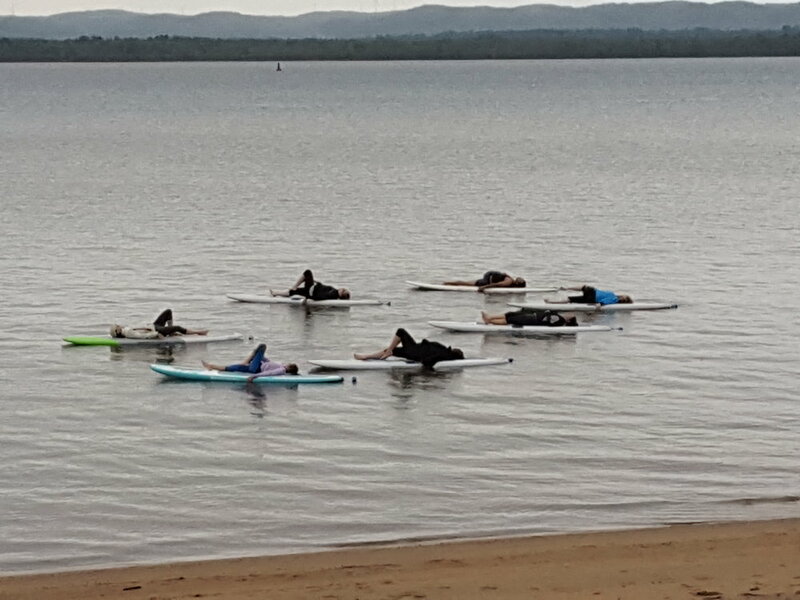 We paddled as our warm-up to acclimate to the boards and water - and stay warm - then clipped our SUPs to sand bags to stay stationary and started the yoga practice. The light sprinkle turned to a steady rain, but I wanted the experience to be complete...so even our savasana was in a light rain. 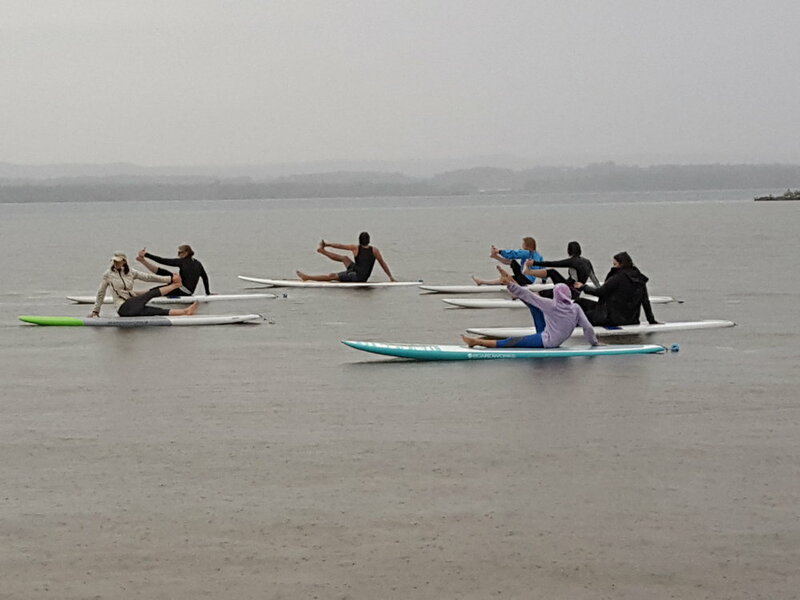 Thankfully everyone was a great sport about weathering the elements and enduring a less traditional SUP yoga practice with the sun behind the clouds. At the end of every SUP yoga session, I ask the question, "what's the one word to describe how this experience made you feel?" The responses ranged from "hot" (I believe in the trendy sense) and "freezing," to "fun and "adventurous." There's a great expression that says "life isn't about waiting for the storm to pass, it's about learning to dance in the rain..." and in our case, we made the best of paddle boarding in the rain. Now we'll see what the travel writers will report about this experience!